The hen is owned by Huang Yazhou, a railway worker from Huaibei city, Anhui province, reports Chinanews.com. One morning, Huang awoke to hear the hen, which he bought from a market two months ago, making weird noises. 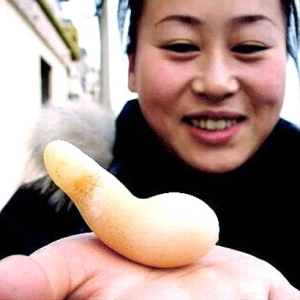 When he checked, Huang found the hen had laid a spoon-shaped egg, 8.5 centimeters long and 35 grammes in weight. Huang said he had never seen an egg like it before in his life. 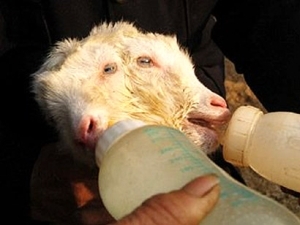 A two-headed lamb has been born in China. Farmer Han Dianrong, 74, of Yantai city, Shangdong province, said he had never seen anything like it. The lamb, one of four born to the same ewe, has four eyes and two mouths. Mr Dianrong says both heads bleat together when the lamb sees people approaching.The weight of two heads is too much for the lamb's neck so it has to be fed by bottle.